Not everything included with Red Dead Redemption's Undead Nightmare, due Tuesday, involves reanimated corpses. You'll also get "land grab," a multiplayer mode that's a variant of king-of-the-hill, played on wider turf. To play it, head to Armadillo, Blackwater, Chuparosa, Escalera, Las Hermanas, MacFarlane's Ranch or Thieves Landing. There's a post there that says "Land Grab." That;'s where you activate the game. When it starts, you're given control over an area displayed on your in-game map. To keep hold of it, you must remain inside that territory and fight off any enemies who enter it. Death or leaving the radius surrenders your claim. Opposing players can also sneak in and trigger the post themselves, giving them the claim. When the match time runs out, the pot of experience points is divided among all players who held the land, largest percentages going to those who held it the longest. The mode supports posses and features a variety of XP bonuses depending on who holds the land and who's doin' the killin'. 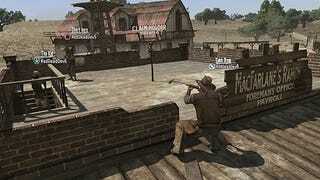 Three players are the minimum necessary to start Land Grab, but all must have Undead Nightmare.